The ongoing march to achieve more technologically advanced engines continues and certainly the GM Duramax diesel engine exemplifies that quest. The race between GM and its would-be competition has benefited you and me: the improvement in all aspects of these diesel engines is easily quantifiable in terms of horsepower and torque as well as fuel efficiency and endurance. Recognizing how vastly improved these diesels are to their predecessors, it should not surprise anyone that advances in the lubricants for these engines have also facilitated quantum leaps in performance. Any oil, properly rated for use in a high performance turbo-charged engine, is a remarkable lubricant regardless of the base oil used. In this article, I will compare synthetic diesel engine oil to petroleum diesel engine oil and draw some conclusions and make some recommendations. Previous Lube Notes have established fundamentals of lubrication and how oil is made, so if you haven’t read those, a review might be in order. I am writing this article assuming you have read the preceding articles. How well does the oil hold viscosity as temperature increases? This is reflected in the Viscosity Index (VI) rating, with a higher number indicating greater stability. Petroleum oils rarely exceed 100 on the Viscosity Index while some synthetics rate higher than 180. Oils that maintain rated viscosity – instead of thinning out at higher temperatures – perform better in your engine. Thin oil will reduce film strength and result in higher wear rates of critical engine parts. 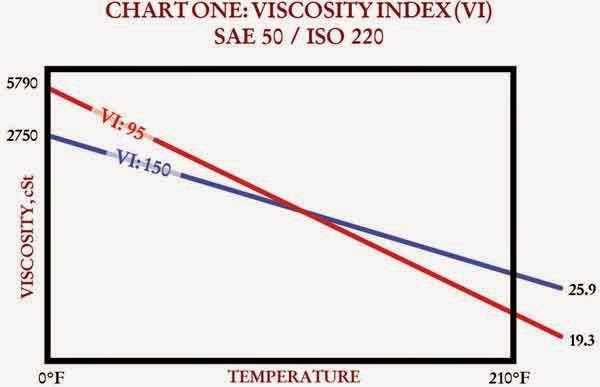 Higher viscosity index (VI) liquids are less responsive to temperature extremes. At 0°F, the VI 95 petroleum oil is thicker (measured in centistokes, a dynamic measure of resistance-to-flow) than the synthetic oil with a VI of 150. On the hot side at 210°F, the VI 150 synthetic maintains viscosity better than the VI 95 petroleum oil that thins out more easily. What are the highest and lowest temperatures the oil can tolerate and still provide proper lubrication, during continuous or intermittent duty? This range is established by measuring the pour point (lowest temperature the oil will pour) and the highest temperature at which the oil can hold sufficient viscosity in order to provide lubrication. 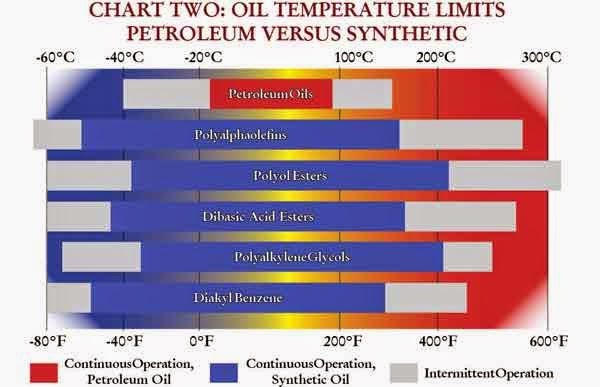 Chart Two demonstrates the superior performance of synthetic oil vs petroleum oil. Group III hydro-cracked synthetics are not on the graph and it is important to note that the Group III synthetics will have similar cold flow performance but significantly less high temperature performance compared to Polyalphaolefins (PAO). PAO and Dibasic Acid Esters are the primary chemicals used in engine and drive line oils. A strong temperature range is paramount to providing proper lubrication, especially in severe duty or extreme temperatures. How well does the oil resist oxidation and sludge formation? As oil oxidizes, it thickens (viscosity increases) and deposits sludge in the engine. Sludge may eventually clog critical oil passages, preventing necessary oil from reaching vital engine parts. This causes excessive wear and, eventually, failure of various engine parts. Synthetics are inert, meaning there are no polar sites (having positive or negative polarity) and simply do not react with oxygen. Petroleum oils are highly polar (mostly positive polarity) and readily react with oxygen. To counter this reactivity, petroleum oils are treated with anti-oxidation additives. When oils are operating in the intermittent range (temporarily outside the normal operating band) they are susceptible to higher rates of oxidation. Unfortunately, today’s engines are forcing oils to operate routinely at 230°F to 250°F. This puts the petroleum oils in a range of temperatures that causes increased use of the anti-oxidants in the additive package and shortens the life of the oil. PAO or Ester based synthetics are in the normal operating band for temperatures in excess of 330°F and suffer little or no oxidation. This is one of the reasons you hear of mechanics reporting how clean engines with synthetics are, even those with high mileage. How easily does the oil vaporize or boil off? When oils are hot, vaporization can result in significant oil consumption and thickening of the oil. Not only is this a problem for oil consumption, but the oil vapor is sucked into the engine via the Positive Crankcase Ventilation system, contributing to significant hydrocarbons in the exhaust (PCV systems have been used in gasoline engines and are now starting to be used in diesel engines). In petroleum oils, the molecular structure is non-uniform, consisting of various size compounds. Imagine countless footballs, baseballs, hockey sticks and tennis rackets all mixed together, pushing against each other. When the oil gets hot, some of the lightweight items are liberated and fly away while the larger, heavier items remain. As this process continues, only the larger items remain, resulting in much thicker oil. In contrast, the molecular structure of synthetics is like a bunch of identical golf balls, all the same size and tightly packed together, resisting vaporization; as a result, they stay in grade for much longer periods and reduce oil consumption. How does the oil affect the seals? Will it cause them to shrink or to swell? And, is the oil chemically compatible with them? Seals are made of a variety of compounds in order to provide rigid but flexible surfaces that promote good sealing in order to keep liquids in and dirt out. Petroleum oils are fully compatible with the seal materials used in modern engines and will slightly swell the seals. While PAO synthetics tend to shrink seals, Esters tend to swell the seals: both are chemically compatible. In synthetics where PAO is the primary base oil, another synthetic oil, Diester for example, is used to provide the desired seal swell and nourishment for seals. Historically, seal compatibility issues have caused real and imaginary problems for synthetic oils in the market place. Currently, seal issues for properly blended synthetic oils are no longer an issue. How well does the oil lubricate and, in turn, prevent wear? Lubrication is a result of both base oil and additive combinations performing in various lubrication regimes in order to prevent metal-to-metal contact and the wear that results. Where fluid film is retained, the base oil will be the dominant factor in lubrication. Where oil film is not always able to separate the moving metal parts, additives become the dominant factor. The uniform molecular structure of synthetics results in a superior lubricating film. Additionally, the thermal stability of synthetic oils maintains an oil film in much more severe conditions – at higher temperatures, for instance – than petroleum. Additives are relatively equal in performance regardless of the base oil – synthetic or petroleum – with which they are combined. Instead, the anti-wear protection they provide – or fail to provide – is more dependent on their own quality and concentration. For normal temperatures, properly additized petroleum oils and synthetic oils will show similar lubricating qualities. Synthetic oils have higher film strengths and require a lower quantity of additives in order to achieve the same level of protection. In standard anti-wear testing such as the Shell four-ball wear test, some synthetics achieve up to four times the wear protection when compared to petroleum oils. When higher temperatures and pressures are used in such tests, the results significantly favor synthetic oils. As explained above, synthetic oils are less likely to thicken as the result of vaporization or oxidation and they stay in proper viscosity grade for significantly longer periods of service. Several of the other factors for condemnation are the same for either synthetic or petroleum oils and are more dependent on the quality and concentration of chemical additives required to continue to provide service. Soot and total dissolved solids are products of engine combustion and are proportional to fuel air management; turbo charged engines tend to burn cleaner than naturally aspirated engines. Filtration, especially bypass filtration, will have direct effects on soot and dissolved particles and can be effective at increasing oil life. Since lubricating oils are products of base oils mixed with chemical additives it becomes painfully obvious that either the failure of the base oil or the depletion of additives will result in condemnation of the oil. Simply put, oils are unique when compared to each other; even if two synthetics are compared, the choice of synthetic base oil and the quality and amount of the additives can produce widely varying finished products. Oil life is best determined utilizing used oil analysis and then evaluating the remaining oil life based upon the results of a given analysis. Some oil companies, like Mobil and Amsoil have amassed significant data through oil analysis that enables them to make categorical recommendations for longer drain intervals. It is improper to assume that, because you are using synthetic oil, it automatically has an extended drain interval. Some major oil companies – Valvoline is one – are on record as saying their synthetic oil has the same additive package as their petroleum; so, the additives in their synthetic oils deplete just as quickly as their petroleum oils. What is the real cost to use synthetic oil compared to petroleum? To correctly assess cost, it is necessary to differentiate between price and cost. What you pay for an item is the price, how the price is distributed with respect to product utilization over time is cost. For example, if you pay $160 for an 80,000-mile radial tire, then that is the price to purchase the tire. To determine the cost, you have to distribute the $160 over the 80,000 miles; this determines the cost per mile to use the tire. This method allows the direct comparison of products that are priced differently yet have variable life expectancy. Calculating cost is a little of a mixed bag when comparing synthetic and petroleum oils. Not all synthetic oils are designed for extended oil drains and some petroleum oils will perform much better than others. Comparisons are best done on a case-by-case basis. In general, most any synthetic will run longer between oil drains; however, only a select few are designed for very long drain intervals. For the synthetic oil to be equal or less costly, it must have approximately three times the drain interval of a given petroleum oil (see the cost comparison table on the next page). There are other, indirect cost benefits to synthetic oils, including improved fuel economy and superior lubrication that results in less maintenance. One unheralded feature of synthetic oil is insurance: by that I mean protection from unexpected calamities. The blowing of a radiator hose, the loss of oil or a water pump failure, in most cases, may result in engine damage from excessively high temperatures. When PAO or Ester based synthetics are used, engine damage is highly unlikely to result from engine overheating. This insurance can mean saving thousands of dollars on repairs. Comparing the features of synthetic oils versus petroleum oils is an exercise that all lubrication professionals have fun with, but for the consumer, what is the bottom line and what action should you take? Clearly, synthetics win in head-to-head features and benefits and they also provide intangibles such as insurance but should every owner switch? The answer is “no”. If you own an older vehicle with more than 100,000 miles, you should not switch unless you have an experienced professional to guide you through the process. If you have a vehicle with leaks that you can not fix, then it makes no sense to pour the higher priced synthetic oil on the ground. If, for some reason, your engine is consuming oil at an alarming rate, again, it is not cost-effective to use synthetic oil. On the other hand, synthetic oils are superior in performance; the right synthetic is more cost effective than petroleum so there is little reason not to switch. The high temperatures (> 600°F) possible in the turbo-charger make synthetic oils (PAO and/or Ester) clearly the best choice; one failed turbo buys a lot of synthetic oil. If you are towing or otherwise involved in severe duty operations, then synthetics offer so many superior benefits and enhanced protection that it is the only right choice. Using petroleum oil vs synthetic oil is an option analogous to using bias ply tires instead of radial tires. Of course the bias ply tire can get you from point A to point B. The difference is in the load carrying capacities, heat range, traction, handling and tread life. For simple casual driving with no severe conditions the bias ply tire may work fine but in the event of something outside normal conditions, the radial is superior; it is simply a matter of the quality of each tire’s construction. The decision, whether to use petroleum oil vs synthetic oil, is dependent on your unique situation; each of us has his own set of circumstances to assess in order to make a decision based on facts. Understanding the benefits and limitations of engine oil will help you make an informed choice. Making sense of the relationships between oil properties and how those properties protect and preserve an engine is the only real way to analyze true cost effectiveness. Sometimes the decision is obvious; severe duty situations call for synthetic oils. Critical components subject to high temperatures like the turbo-charger are best protected by synthetics. I recommend synthetic engine oils in order to provide the most cost effective method to achieve the best lubrication possible for your engine.